Are you or fellow members of your club, organization or show interested in improving their fly fishing knowledge and fly fishing stillwaters in particular? Why not contact me regarding one or a number of my seminars listed below. 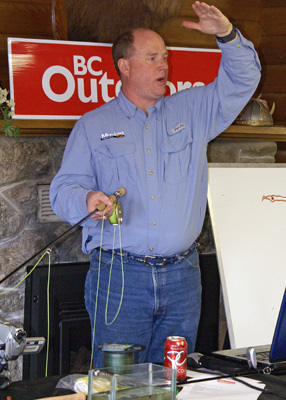 For many years I have had the good foturne to provide comprehensive fly fishing seminars to fly clubs, outdoor shows, weekend seminars and schools across North America. I also have experience putting together a customized evening, full day, or weekend seminars. All seminars feature interacitve PowerPoint style presentation format. On camera tying segments or instruction is a popular component many choose to integrate into their seminar(s). For more information regarding any of your seminar needs and my availability, please contact me via email at flycraft@shaw.ca. Phil Rowley Seminar Subjects (34 KB). Lakes are on of the most challenging opportunities available to today's fly fisher. Stillwaters offer a long active season with numerous hatches and presentation challenges. Fish grow big and fat and many find this appeal hard to resist. But the transfer from rivers and streams is often difficult, especially if a prolonged trial and error approach is adopted. This program examines the stillwater fly fisher's kit bag, expectations, and an introduction into the diverse food sources. Everything the aspiring stillwater fly fisher needs to be successful in order to build a sound foundation that will last through a lifetime plying stillwaters. Stillwaters offer a long fly-fishing season and the chance of larger fish, for many a fish of a lifetime. Yet for many stillwaters are a source of constant frustration and dissatisfaction. This program is designed to give the fly fisher a comprehensive understanding of fly fishing stillwaters. We will look at a number of factors affecting the stillwater fly fisher plus the associated strategies and tactics to cope with each situation. This program should help the fly fisher understand stillwaters and make the most of the conditions at hand. With all sports, training and practice are keys to success. Drills, repetition and attention to detail develop and maintain good habits. Stillwater fly-fishing is no different. Successful stillwater fly fishers consistently demonstrate good habits born from years of practice and experience. This presentation walks you through ten top stillwater habits. Practices stillwater fly fishers should do on every outing and trip, from shoreline preparation to on the water tactics. Fly fishers incorporating these traits into their game plan should see their results improve. One of the main attractions for many stillwater fly fishers is the chance to catch and release the trout of a lifetime, a true trophy. But these wily specimens do not come easy to the hand. This program examines the subtle nuances needed to successfully dupe monster trout along with tackle considerations, pre trip research and other associated strategies and tactics. Dispersed throughout this informative talk are some of my favourite trophy waters, many easily accessible. Fly-fishing has its roots firmly entrenched in rivers and streams but ever year sees more and more anglers making the migration to stillwaters. But lakes are vast intimidating pieces of water with most providing little or no clues as to the disposition and location of its rich quarry. This presentation examines the many factors affecting fish behaviour and their subsequent location within a given lake. Water temperature, barometric pressure, sunlight and a host of other variables have a decided effect upon trout. Applying logic familiar to most river and stream anglers this program focuses upon using these variables as a tool to quickly eliminate non productive water ensuring successes far out way the failures. Sinking lines are synonymous with fly fishing stillwaters as the majority of stillwater trout feed deep beneath the surface. These lines allow fly fishers to target trout at a variety of depths and successfully mimic the natural path of many prey items. Sinking lines offer an array of benefits including minimizing the negative effects of wind, the ability to cover water both horizontally and vertically and to target fish feeding at depths of 15 feet or more. This presentation explains how to choose sinking lines, understanding sink rates, when to use sinking lines as well as specific sinking line tricks and tactics. Techniques such as the “washing line”, count down, line marking, fishing the hang and much more will be discussed in detail. This program is a must for anyone wishing to add to their collection of stillwater tricks and tactics. Stillwater trout do not always take our flies as a result of a feeding response. Trout are predators and as such possess aggressive tendencies that we as stillwater fly fishers can take advantage of. Knowledge and understanding of attractor tricks and techniques can save the day when typical imitative techniques do not work. This program reviews the theory of attraction and its practical application when fly fishing stillwaters, when to use attractor techniques, equipment considerations, pattern choices and presentation techniques. Throughout the open water season stillwaters move through distinct seasons from spring through fall each with its own unique nuances. These seasonal variances have a key influence of trout behaviour and location. Understanding these variances is critical. This program links these variances with the most predominant foods sources and associated strategies and tactics including gear considerations. Depending upon the timing of this presentation viewers have the opportunity to customize this presentation to the specific season of their choice or if time permits to incorporate a complete seasonal portfolio. Throughout the open water season chironomids are the number one item in the diet of trout in productive stillwaters. Most fly fishers agree on the importance of this hatch but a disproportionate amount feel confident imitating this challenging food source. This program details the life cycle, habits, fishing strategies along with thoughts on equipment. The program also details fly pattern design and material considerations, including my own personal pattern designs. This program would be of great assistance to anyone wishing to improve their skills and understanding when tying and fishing Chironomids. Strike indicators have become an essential component within the stillwater fly fishers arsenal. They provide the fly fisher with the ability to surgically control two key elements, retrieve speed and depth. Originally intended for suspending chironomid patterns at a precise depth strike indicators have evolved to other presentation techniques including leeches, baitfish and caddis pupa. This seminar delves into the world of strike indicators detailing the various types, the advantages and disadvantages of each type, casting techniques as well as presentation tricks and tactics including balance flies unique to strike indicators. This presentation takes anglers from the basic “heave it and leave it” philosophy to the next level when using indicators on lakes. The sport of fly-fishing is made up of many factors. Once of the most important and interesting is the comprehensive understanding of what organisms' trout feed upon. This program details the many organisms that are available to trout in stillwaters and links their unique characteristics to the vise, the foundation principle for my book, Fly Patterns for Stillwaters. Discussion points include what materials work best and why, key features and triggers along with a host of other tips. This program provides the stillwater fly fisher and tyer with the bridge between natural and imitation. Western Canada is arguably home to most of the world's finest stillwaters. Nestled within the western region are thousands of lakes all containing vast populations of willing and aggressive trout and char. To the visiting or new fly fisher the choices seem daunting. This program takes the mystery out the equation providing the angler with a comprehensive list of candidates. Favourite tactics, hatches and other key information is provided for each lake. This program is ever evolving as with each season different lakes rise to the forefront. Viewers are guaranteed to have the most up to date and recent information. For most fly fishers nothing equals the thrill of the rise to a well-presented dry fly. While most of the food sources trout prey upon in stillwaters reside beneath the surface there are still ample and rich opportunities to tempt trout to the dry fly. Lakes with rich hatch opportunities train trout to the surface making the dry fly a season long proposition. This program focuses upon the best-imitated food sources such as caddis and mayflies to some not so well known including boatman and baitfish. Tactics, presentation and methods of selecting the most likely stillwaters and times of the season are another key component of this unique presentation. Not all trips work out exactly as planned. Fly fishers can take almost every factor into account but if the main guest of the party doesn't want to show up what is the fly angler to do? The program looks at the all too often reality of fly-fishing stillwaters. What to do when fishing is tough. For most the opportunity to get on the water is limited and not subject to quick rescheduling. Weekends, days off and vacation are typically booked and planned well into advance. This program takes a detailed look at what factors lead to tough stillwater fly fishing, the resulting effect on fish and most important off all what can fly fishers do to beat the odds. This program doesn't guarantee great fishing on every trip but when the odds are swayed in the opposite direction fly fishers should still be able to salvage a trip while others suffer in frustration. Most fly fishers consider sinking lines of various densities the prime stillwater presentation tool. While sinking lines are an invaluable component of any stillwater kit bag no one should be without their floating line. Often thought of as the chironomid fly fishers primary presentation tool floating lines are an ideal stillwater choice. Fly fishers can suggest a wide variety of prey items throughout the water column to depths of 20 feet or greater. This program details the rationale and purpose behind the ‘naked’ technique, using of floating lines and long leaders on stillwaters. Anglers will be introduced to the 4 keys necessary for a successful floating line presentation, detailed dropper discussion, wind drifting, retrieves and the various food sources this method does such a fantastic job representing. If I had to limit myself to just one presentation technique the ‘naked’ technique would be it. Pristine stillwaters offer unique hatch opportunities for the dyed in the wool hatch matcher. From Callibaetis mayflies to the annual autumn fall of water boatman and backswimmers lakes offer the fly fisher a wide variety of match the hatch opportunities throughout the open water season. This program examines in chronological detail the vast variety of hatches available including specific bodies of water, tactics and fly patterns. Everything the fly fisher needs to plan their next trip to encounter the hatch of their choice. Fly fishers tend to be hatch focused and this trait is not different on stillwaters. The allure of targeting specific hatches can become habit forming but it is not always the most consistent method for success fly fishing lakes. More often than not focusing on the staple food sources that are available all season provides the most consistent results. This program illustrates the importance of stillwater staples including their dominance in seasonal diet analysis. Presentation techniques and pattern rationale are discussed in detail for the key stillwater staples; scuds, leeches, dragons, chironomid larva and damsel fly nymphs. A sound understanding of staples ensures consistent stillwater success while devoted hatch chasers watch with envy. Fly fishers investigating stillwaters soon realize mayflies are not the dominant insect they are on rivers and streams. Granted there are fewer stillwater mayfly species, those that are prevalent are often important. This is particularly true of one species, Callibaetis. This program takes an in depth view of the Callibaetis species providing anglers with the knowledge and skills necessary to cope. Fly fishers will learn lake types are home to Callibaetis, and to understand the various life stages and how best to take advantage of them. Presentation techniques and specific equipment considerations will also be discussed in detail. Specific attention to reading rise forms will be discussed. Finally fly pattern considerations will also be covered in depth including the best situations to use nymphs, emergers and adult patterns. In 2007 I was fortunate enough not only to participate in the Canadian National Fly Fishing Championships but to be a member of the gold medal winning team. I did not have the luxury of having any pre tournament practice on the venue lakes due to work commitments. It was imperative to be successful on all waters and avoid the dreaded blank. Never having fished the venue lake previously a structured organized approach was critical to success. In this seminar students will learn the manner in which I plan and approach a new body of water in order to be successful. Structure, water temperature, surrounding land and pre trip planning are some of the many factors in developing a successful plan and approach. Caddisflies or sedges may have been put on the planet to drive fly fishers crazy. No other family of aquatic insects has so many unique variables to consider as sedges. This is particularly true of stillwater caddis species. In this program students will be provided with a logical approach to identifying stillwater caddis including in depth knowledge of their lifecycles and emergence behaviour. Detailed discussion focusing upon presentation tricks and techniques along with pattern considerations form the final links to each caddis family. Damsels and dragons are two significant staples all stillwater fly fishers should be familiar with. When conditions are tough or fish appear spread out and difficult to find fishing damsel or dragon patterns can be the key to the puzzle. Although both come from the same family, Odonata, each differ in a variety of ways that are important for the fly fisher to know. This program focuses upon their individual life cycle and traits. Presentation and pattern strategies are discovered in detail providing the fly fisher the tools and tactics to be successful. To those who don’t fish the mere mention of leeches brings about involuntary facial contortions and sometimes surprise at their use as bait or imitation when fishing. From a fly fishing perspective leech patterns make ideal searching patterns and are a big fish conqueror. For the neophyte fly fisher leeches are tough to present incorrectly. On stillwaters, leech patterns are a preferred choice during non hatch periods of early morning, late evening and during the summer doldrums. This program focuses upon a variety of presentation tactics including sinking line, floating line and indicator presentations. Pattern keys are also discussed in depth from subtle to obnoxious. This seminar is a must for any one wishing to get more out of the leech section in their fly box. From an adrenalin perspective few food sources can be as fun to imitate as water boatman and backswimmers. Depending upon the region these insects range in importance from a few key weeks to months. Surprisingly enough, these insects are two of the most commonly confused. Proper identification is critical to both presentation and pattern choice. Students will learn how to distinguish between the two and the proper presentation tactics for each. Both floating and sinking line tactics are discussed in detail. Fly fishers will be introduced to the English washing line technique along with other tactics utilizing buoyant patterns.